Getting around downtown is a cakewalk. The success of any city is measured in part by the variety of viable transportation options it can provide its employees and residents. 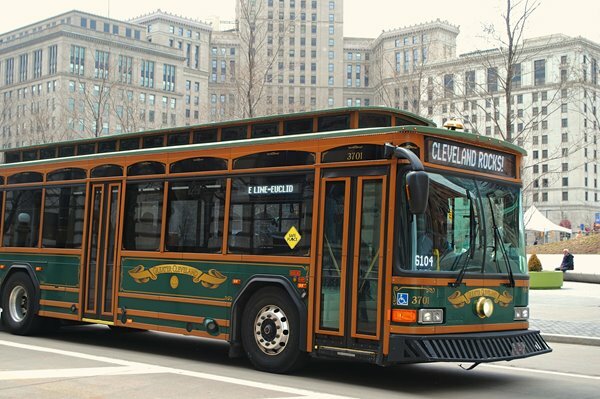 While Downtown Cleveland is serviced by a superior network of highways, it is the service provided by RTA (Greater Cleveland Regional Transit Authority) that really gives downtown residents, employees and visitors a diverse set of transit options. RTA's newest transit line serves one of the city's busiest routes, the Euclid Avenue Corridor. Completed in 2008, the HealthLine is a state of the art Bus Rapid Transit (BRT) system that features dedicated lanes along Euclid and off-board fare collection, which dramatically increases the speed of a commute into and out of Downtown. The sleek 60-foot articulated buses run on a diesel-electric hybrid motor system that produce 90% less emissions than regular buses. Best of all, the HealthLine operates 24/7 and is very easy to catch. During rush hour, you can catch the HealthLine as frequently as every 5 minutes. Click here for map route (PDF) and schedule. 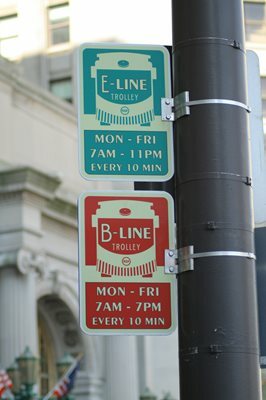 One of the most successful additions to RTA's system was the creation of the E-Line and B-Line trolleys that serve Downtown. These free trolleys routes provide downtown employees, residents and visitors a quick way to get to the most popular destination of the city. Two of the routes operate from 7:00am - 7:00pm Monday-Friday. Each line runs with a 10-minute service interval, so you're never far away from quick, easy, and FREE downtown transportation! 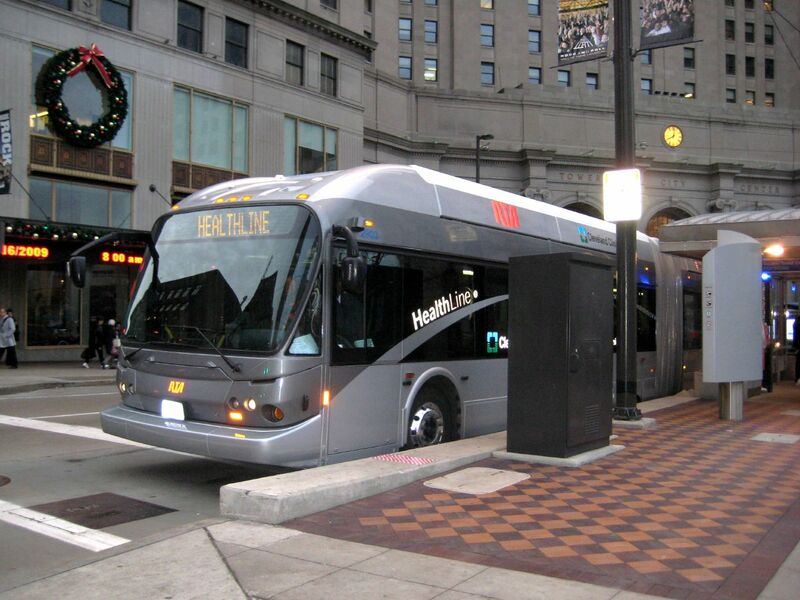 E-Line serves the Warehouse District on W 9 and W 6 streets, Public Square and Tower City, the Entertainment District on E 4 Street, the theaters in Playhouse Square, Cleveland State University, and other commercial spots on Lower Euclid Avenue. Click here for map route (PDF) and schedule. B-Line circles Superior and Lakeside Avenues between W 6 Street in the Warehouse District and E 12 Street. It serves the State Office Building, Public Square and Tower City, Cleveland Public Library, the Convention Center, Cleveland City Hall, the Federal Office Building, Cuyahoga County offices and many other commercial locations. Click here for map route (PDF) and schedule. C-Line Conveniently connects from the Horseshoe Casino and Public Square to area hotels like the Residence Inn Cleveland, Wyndham Hotel, Ritz-Carlton, Renaissance Cleveland, Hyatt Regency, Holiday Inn Express, Embassy Suites, Hampton Inn and the Downtown Marriott. It also serves the Warehouse District and theaters in Playhouse Square. Click here for map route (PDF) and schedule. NineTwelve Trolley serves the NineTwelve District between East 9th and East 12th streets. Hours are 5:45 a.m. - 9:00 a.m. and 2:45 p.m. - 6:00 p.m. Monday - Friday. Services the Quicken Loans Arena parking garage and the Lakefront Municipal Parking Lot. Click here for map route (PDF) and schedule. 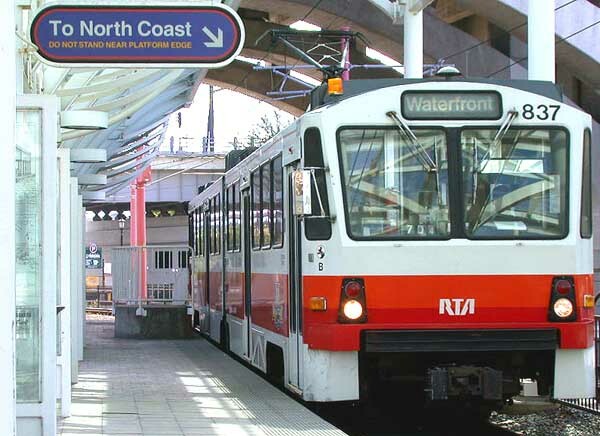 The center of the city is also serviced by 3 major rail lines and 1 special service rail line (the Waterfront Line) that carry people into and throughout Downtown. All rail lines meet at the main terminal at Tower City Center. From there it is merely a matter of minutes to anywhere in Downtown thanks to dozens of connecting bus routes, trolleys and the HealthLine. No matter what the traffic or the weather is like outside, your commute into Downtown will be a breeze. Even getting to the airport from Downtown is a breeze with the RTA's Red Line, which drops you off right inside the terminal (one of only a handful of cities in the country that provide direct rail access from the city to the airport). Dozens of bus routes travel through Downtown everyday. In order to create a more efficient flow of bus routes into and out of Downtown, RTA created the new Stephanie Tubbs Jones Transit Center located at Prospect and E. 21st near CSU's Wolstein Center. The new center provides a safe and clean "airport-like" environment for RTA customers to wait for and to transfer between bus services. For a complete list of bus routes and schedules, click here. 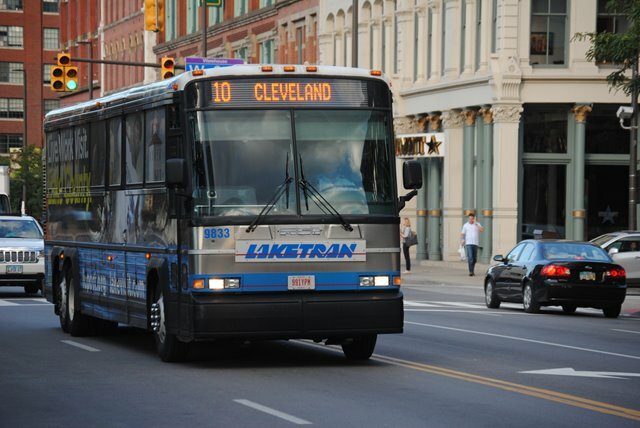 Laketran offers Park-n-Ride service connecting Lake County and Downtown Cleveland. Laketran Routes 10-13 serve destinations across Downtown Cleveland, from Cleveland State University to Ohio City and the Near Westside. Operating Monday through Friday from 5:30 a.m. until 6 p.m., Laketran has 18 daily departures from 9 different locations in Lake County. Laketran Park-n-Ride schedules also offers reverse commuting options for those living in Downtown Cleveland and working in Lake County. Park-n-Ride buses are equipped with on-board bike racks to help you get to your final destination or you can transfer free to Greater Cleveland RTA. Bus on Shoulder allows Laketran buses to travel on the I-90/SR-2 shoulders between the Euclid Spur and downtown Cleveland when traffic is traveling less than 30 miles per hour. While others are sitting in traffic, Laketran buses can keep moving, getting riders to work on time. Laketran also offers a Guaranteed Ride Home to reassure Park-n-Ride riders in Cleveland that they can get back to Lake County in the event of an emergency. Laketran Rider Tools include a trip planner, real-time map, next bus departure text messaging, text and email rider alerts, and a mobile app that offers you quick access to all of these tools. Laketran offers a free trial on Park-n-Ride to give it a try. For route suggestions or more information, contact Kerry Jonke at 440-350-1008.